There is just something about a good kids picture book, the kind your child begs you to read over and over again. 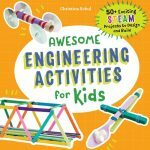 They are the books that inspire some fun kids crafts. We recently read one of our favorite books that features several jungle animals. 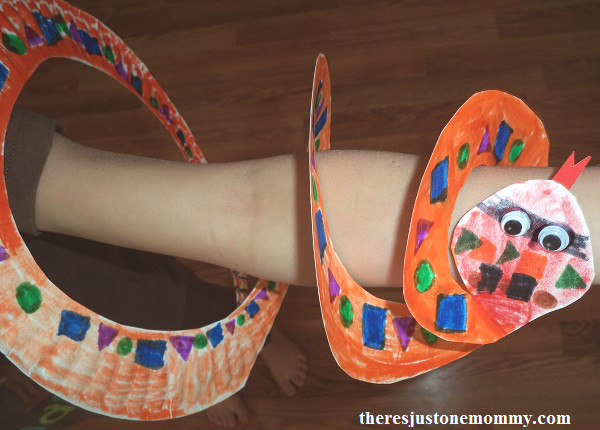 The kids couldn’t wait to do this fun snake craft, inspired by one of the characters in the book. Cut each paper plate into a spiral, starting at the outer edge and working towards the middle. Leave a circle of approximately 2 inches uncut in the center. You can trim this into a triangular shape to become your snake’s head. 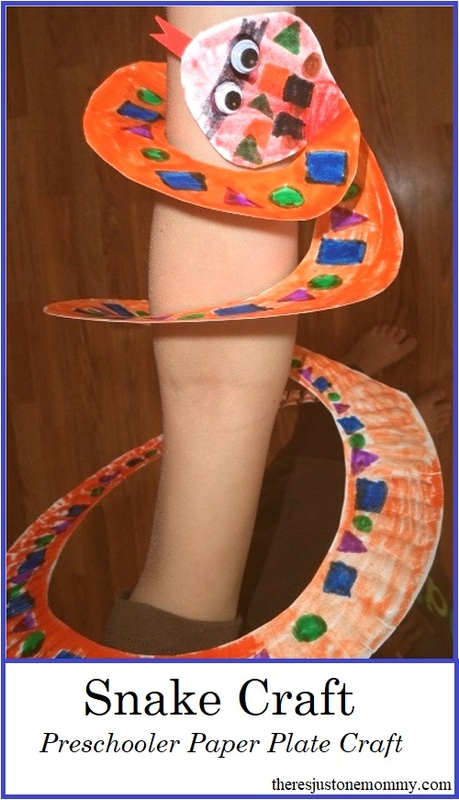 For younger children you can lightly draw the spiral shape for them to cut. 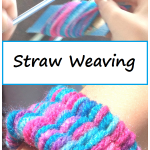 Challenge your child to create their own pattern for their snake. For very young children you might want to try a simple AB pattern. 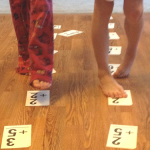 Older preschoolers could try a more difficult pattern. Or, you can let them decorate it any way they’d like. Once the snakes are colored, glue on googly eyes and add a small sliver of red ribbon or construction paper for the snake’s tongue. Affiliate links have been used below, see my full disclosure here. 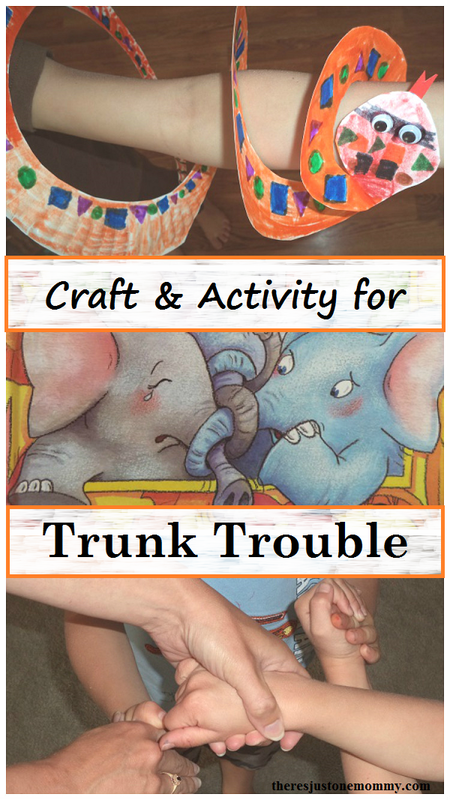 This craft and book activity went perfectly with one of our favorite picture books, Trunk Trouble: Jungle Tales. Trunk Trouble is a cute story about 3 elephants who, in a hurry to get home for dinner, somehow get their trunks all tangled together. Several animals come along to help them. One of them is Seymour the snake. The kids love when I read Seymour’s part, stretching out all the “S” sounds — just the way the book has it printed. The story always has them giggling, and the pictures in the book are spectacular. Since Seymour the snake is one of their favorite characters, we decided to make this snake craft to go with the book. To demonstrate to the kids just how tricky it would be to have your trunk tangled like the elephants in the story, we played our own tangled trunks game. Start off standing in a circle. 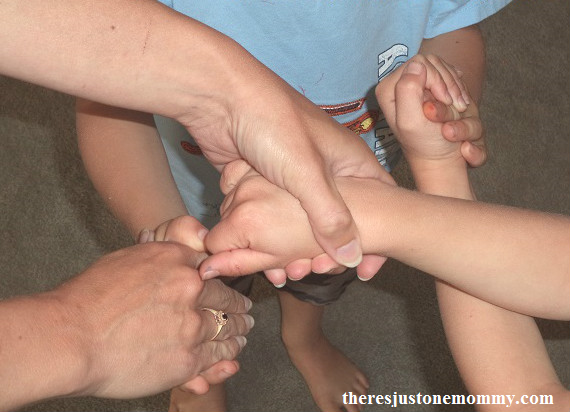 Have everyone put their hands in the center and grab hold of another person’s hand. Their arms will look quite tangled. This simple snake craft is fun to make on its own. It also pairs great with a jungle-themed picture book like Trunk Trouble. 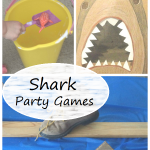 Looking for more fun book activities?